I am somewhat embarrassed to admit, today, that I don’t know what gelato is. Well, at least I didn’t know what gelato is until I did some research. You see, over the last 18 months I have noticed a slow but steady influx of gelato into the freezers of my local natural foods store. It sits next to the ice cream in pint-size containers that look just like ice cream. For a while, I assumed it was a fancy name for frozen yogurt. Or maybe Jell-O with dairy mixed in. Neither thought is correct. Gelato is actually an Italian variant of ice cream. Ingredient-wise, the primary difference is that gelato uses less buttermilk. Gelato also tends to have a silkier, smoother texture to it. What’s interesting about gelato is its importance in Italian culture. How does one explain, in a few short paragraphs, something that’s such a critical part of Italian life, like gelato? If you’ve spent any time in Italy, especially in the summer, it’s hard to look anywhere and not see an Italian balancing a cono di gelato, often while balancing the omnipresent cell phone at the same time. But everyone, from suave businessmen in Armani suits to grandmothers chatting on a stroll with friends—they all eat gelato. And like the tiny shots of espresso taken from morning ’til night, it’s a part of Italian life and consumed everywhere, all-day long. Gelato is serious business in Italy. Ice cream requires only a handful of ingredients: Milk, cream, sugar, and a stabilizer. Stabilizers in store-bought ice cream tend to be guar gum, locust bean gum, or tara gum; in fresh ice cream intended for immediate consumption, egg yolk is used as a stabilizer. 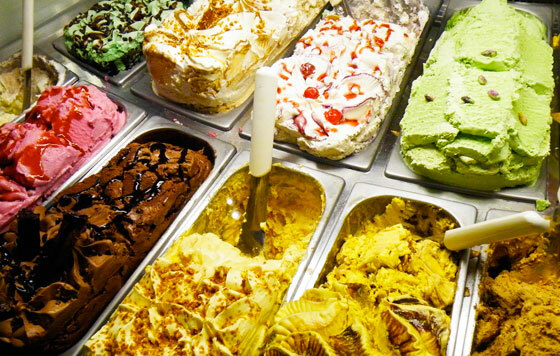 In Italy, gelato is made from scratch and eaten when its fresh. Italian gelato shops don’t mess around with gums as stabilizer: they stick with the good stuff. Consequently, the shelf life of real Italian gelato is measured in hours, not days. Americanized gelato, on the other hand, tastes a lot like standard ice cream. US manufacturers use cold-process mixtures and gums to stabilize it. There are a few small gelato shops in America using fresh Italian production methods, such as Zingerman’s Creamery in Ann Arbor, but not many. Should you be buying gelato instead of ice cream? The answer this question comes down to personal preference. There isn’t much difference between store-bought Americanized gelato and normal ice cream, so if you’re eating that you probably will not notice a difference. But if you have access to a small artisanal gelato shop you might just fall in love with it as the Italians have.